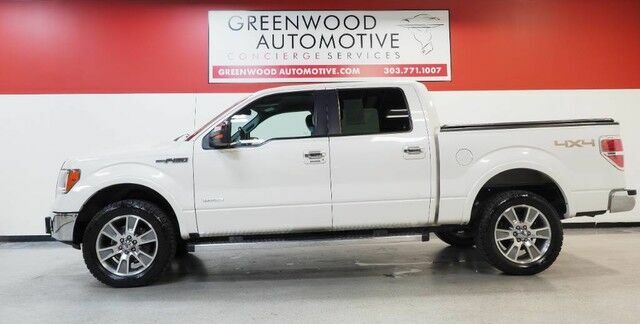 This outstanding example of a 2013 Ford F-150 Lariat is offered by Greenwood Automotive. This vehicle is loaded with great features, plus it comes with the CARFAX BuyBack Guarantee. There's a level of quality and refinement in this Ford F-150 that you won't find in your average vehicle. Where do you want to go today? With 4WD, you can choose to drive virtually anywhere and on terrain 2WD vehicles can't handle. Intricately stitched leather and ergonomic design seats are among the details in which test drivers say that Ford F-150 is in a league of its own More information about the 2013 Ford F-150: Ford claims class-leading fuel economy, as well as best-in-class towing and horsepower for both its base V6 engine as well as both of the available V8s. Ford also says that it's the only automaker to offer a 6-speed automatic transmission across its entire model lineup. The F-150 also offers electric power steering, which saves fuel and gives an improved steering feel. Across the lineup, the F-150 carries through with the full redesign that the truck received for 2009; since then, the F-150's very purposeful, upright instrument panel and vastly upgraded interior materials have stood out in this very competitive class. This model sets itself apart with wide range of models for all budgets, tastes and needs, class-leading towing and payload capacities, available luxury features, and Powerful and efficient powertrain lineup WWW.GREENWOODAUTOMOTIVE.COM for all Photos Our Dealer Handling fee of $499 is included in our advertised price. Government fee's and licensing are additional costs. For best service and to check availability or to set an appointment to see and drive call Steve direct at 720-339-1516 or Marc at 303-552-7909 For more information. FINANCING AVAILABLE. TRADES WELCOME. *VEHICLE IS FULLY INSPECTED BY OUR MECHANIC. We are located 4 Blocks West of I-25 on North side Of Arapahoe, Behind US Bank at Syracuse St.